Observation - Mallard hybrid - UK and Ireland. Description: Duck, larger than Mallard, dark head, yellow beak, white neck, light orange-brown side, greyish back, curled tail feathers. Swimming with mallard group. 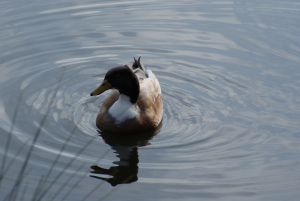 Duck, larger than Mallard, dark head, yellow beak, white neck, light orange-brown side, greyish back, curled tail feathers. Swimming with mallard group.